Witness at Taj: "They came in with all guns blazing. It was just chaos"
Diner: "My colleague saw someone get shot just outside of the glass doors"
(CNN) -- Witnesses caught up in the terrorist attack on Mumbai have spoken of how they ran for their lives, smashed windows to escape and sheltered in hotel rooms as the horror that has claimed more than 100 lives unfolded. An Indian police officer directs people leaving the Taj Mahal after gunmen attacked the hotel overnight Wednesday. 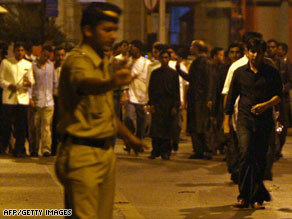 One of the targets for the gunmen was the Taj Hotel, one of Mumbai's most famous landmarks. Anthony Rose, an Australian visiting Mumbai to produce a travel show, told CNN Thursday that he checked into the Taj hotel just a minute before attackers stormed into the lobby Wednesday night. Rose and others found refuge in a hotel ballroom, where they waited for six hours hoping to be rescued. Help never arrived and the group were forced to smash a thick glass window and climbed down to the street on curtains. "As soon as the hotel was on fire, we knew we had to go," Rose said. Testolini was eating dinner at a restaurant across the street from the Taj when she saw the gunmen approach. "We heard some gunshots," she said. "My colleague saw someone get shot just outside of the glass doors of the restaurant. Obviously, that prompted us to jump up and run." Testolini left all her possessions and scurried through the kitchen of the restaurant to the sound of gunshots behind her, before heading with colleagues and restaurant staff to a darkened ballroom in the Taj. There they waited for two hours, listening to constant bullet barrages and grenade attacks outside. She then received a phone call from the hotel, telling her to turn her lights off, put a wet towel by the door and stay in her room until told otherwise. So Wong sat in the dark, watching smoke rise outside her hotel window. "I saw a guy outside the window above me who had smashed the window and was hanging out," Wong said. "At that point, authorities told us to run out of the hotel." Wong said she passed dead bodies in the hotel's halls as she searched for an exit, finally leaving through the pool entrance. Wong said: "I thought it was going to end but it seemed to never end." "I came back from dinner last night at nine with a colleague, came into the lobby," Abell said. "The security fences weren't operating; the hotel shook with an immense blast. Three or four minutes later, there was another large blast, the whole building shaking. "I looked outside to see a crowd running. It was chaos, gunshots; it looked all very, very nasty." The Oberoi Hotel, which also has a reputation as one of Mumbai's most famous hotels, was also targeted by the gunmen. "I was up on the 11th floor and while I was on a conference call, I heard two large noises, and they sounded like thuds from within the room, and that's when we realized that there was something serious happening. "When I heard the two thuds, that's when I looked out window and onto my left I could see the Oberoi Hotel -- there was a restaurant in the Oberoi Hotel -- which was under flames," Patel said. Australia: Department of Foreign Affairs offers this number in Australia: 1-800-002 214. "We left our room, walked down the fire exit, the hotel staff met us down at the bottom of hotel and put us into large banquet hall where we saw about 150 to 200 people. The lights were out, so we were just told to huddle there until we heard further." "We stayed there for about one hour, that's when we heard another large two bangs. We couldn't tell if they were from outside or within the hotel, then we heard some gunfire. Twenty, 30 minutes past that, one of the senior advisers of the hotel mentioned we would be escorted to the back of the hotel, put into groups of 10 people and told to run to the neighboring cinema hall, where we would be safe. "I think most of the activity was happening in the lobby," Patel said. "People were talking, rumoring about the fact that terrorists were in the hotel, so there was a search by room-to-room, so I think the activity was happening in the hotel and the front of the hotel." "We're all safe in our apartment right now, following instructions by the police to stay at home with the doors locked and away from windows," Mundhra told CNN. "Just as we were getting ready for bed last night, I heard a little bit of commotion on the street and some police sirens and didn't really think much of it. Then my parents came in and told me something was going on in the neighborhood. So we watched the news and realized essentially there's a terrorist attack happening just outside our door." "We've been indoors since we've been hearing things from out of the window -- bombs and police sirens and all kinds of chaos," Mundhra continued. "I've been watching in on TV and it's very hard to connect the two, that all of that is happening right outside our doors. "We haven't really been in touch with our neighbors, we've just been locked down in to our apartment. "We were told to stay indoors, not leave our houses, stay away from windows. I know that the people who are in buildings surrounding the Oberoi have been advised to keep lights off and windows and blinds closed and we've done all of that, and just keeping an eye on our family."